Prices are listed in € (Euro), per person per night including vital half-board and all taxes and fees (spa tax is added) unless otherwise stated. Size: approx.. 20m², for 2 Pers. Modern country style, shower, toilet, TV and safe. 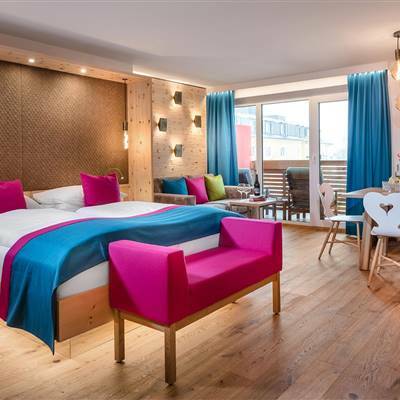 High-quality wood, cheerful colors and modern art form a smart and modern ambience. Size: 20m², for 2 Pers. Size: approx.. 30m², for 2-3 Pers. Timeless classic living comfort for all, who appreciate alpine Quality and a good location. The room is with South-facing balcony, bath or shower and living area. Noble cherry wood interior in the classic timeless style. 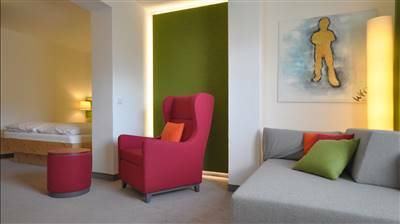 Colourful style, high-quality fabrics and specially made acrylic paintings by host Christoph Weiermayer. Size: 30m², for 2-3 Pers. Size: approx.. 25m², for 2-3 Pers. Alpine modern living comfort, for those who like it chic and smart with shower, toilet, TV and safe. Size: 25m², for 2-3 Pers. Modern country-style style, for those who like style, modern and comfortable. 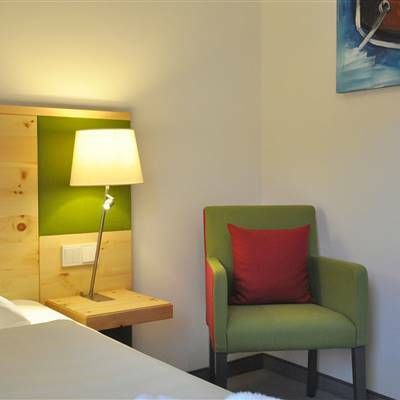 This room type is furnished in high-quality domestic larch or in soothing stone pine. 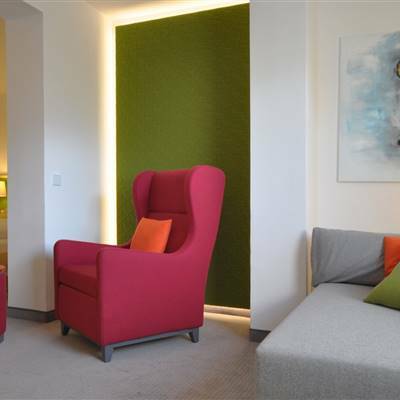 Combined with high-quality fabrics, a modern color concept and specially made acrylic paintings by host Christoph Weiermayer, you will find the inspirational impulse design here. Size: approx.. 18m², for 1-2 Pers. Noble cherry wood interior in the classic timeless style. 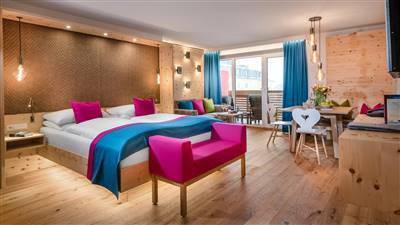 Work was done here with bright colors, high-quality fabrics and specially made acrylic paintings by host Christoph Weiermayer combined. Size: 18m², for 1-2 Pers. Size: approx.. 40m², for 2-4 Pers. For lovers of modern chic and lots of space. In addition, panoramic location to the outdoor pool and mountain views. 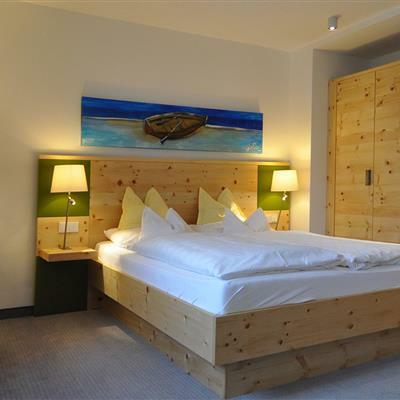 Friendly, spacious room in a modern design and dream location in our Vitalhaus overlooking the Schlossalm and our outdoor pool. Design classics, cheerful colors and specially made acrylic paintings by owner Christoph Weiermayer convey a lively yet cozy ambience. Size: 40m², for 2-4 Pers. Size: approx.. 40m², for 2-3 Pers. Luxurious alpine modern retreat for discerning connoisseurs who loves the dream mountain panorama, SPA Experience: own Infrared cabin in the room. 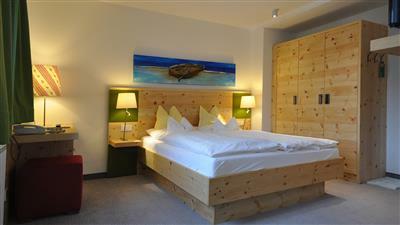 This room type is furnished with the highest quality pine wood. Size: 40m², for 2-3 Pers. This room type is furnished in calming stone pine. The stone pine is combined with high-quality fabrics, a modern color concept and specially made acrylic paintings by host Christoph Weiermayer. Size: approx.. 68m², for 2-6 Pers. 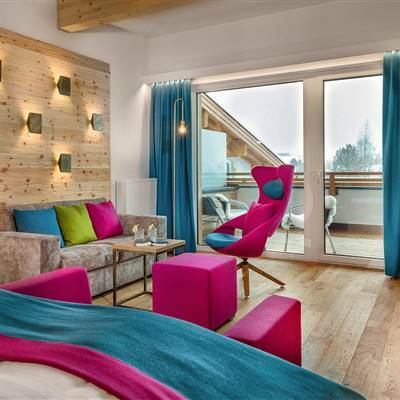 Spacious suites for discerning connoisseurs who want a luxurious alpine equipment and lots of space. 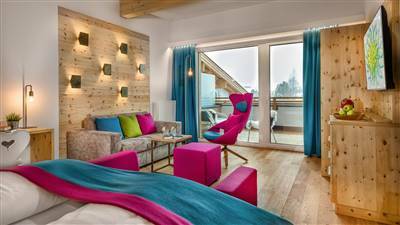 Spacious suite in alpine modern design with solid wood and loden fabrics and dream location with west-facing balcony overlooking the Schlossalm. Size: 68m², for 2-6 Pers. 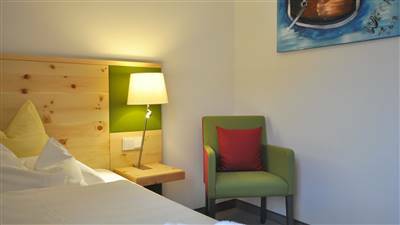 Price lists and offers are subject to the Impuls Hotel terms and conditions. All information, prices and errors are subject to change.